Wheaties published a pair of "how to" panel sets in 1936, one called "How to Star in Baseball" and today's, "How to Play Winning Baseball." 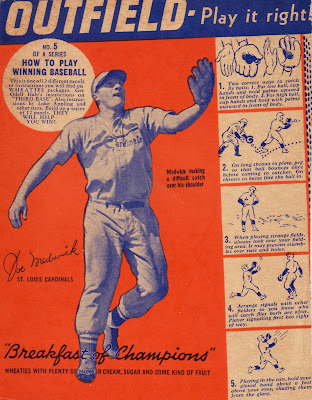 Both show batting or fielding tips on cartoon panels adjacent to a large player picture, like today's shot of Gashouse Gang member Joe "Ducky" Medwick. My favorite how-to cartoon is #3 ("look over your fielding area"), since pro parks today have almost no chance of ruts, holes, or anything save luscious greenery. (Of course, plenty of young players face that "bad field" problem, both then and now.) The complete set numbers 12 panels. Value: My scan trimmed away the ragged edges that make Medwick decidedly low-grade. He cost $15 on eBay in 2005, on the low side of a set filled with Hall of Famers. Complete boxes run much higher, since so few survive today. Fakes / reprints: Haven't seen any fakes in the marketplace, but it's possible they exist, given the set's big names.